From earlier this week, tequila spiked salsa, which went with black bean nachos. Six egg cheese, chive and pinenut omelette (was low on ingredients and the eggs were getting close to their date), should have made two three egg ones instead. That looks pretty good, did you just chuck that all into a deep dish pan? Large-ish pan, wait for the bottom to solidify (still a bit runny on top but not too much) and then grill it in the oven with the cheese (it's done when the cheese starts browning). I'd already lightly done the pinenuts in the pan with a little butter and had them waiting on a plate to be put on before folding it, then chives for a bit of garnish and flavour. Made my own potato chips, left are salt and vinegar (waiting for the vinegar to be absorbed so it's dry) and the right is a salt, pepper, onion, garlic & chicken mix that is okay. It's pretty damn easy to do, but I'll probably get a shaker of chicken salt before making them again. The ones on the right were in a tad long and coloured by the tiny burnt pieces. Last edited by KrimzinZV; 6th February 2016 at 8:32 pm. It is not something I made today, but is is something I have and will continue to make repeatedly. Next time I make it, if I remember this thread I will pics and Progress of it. 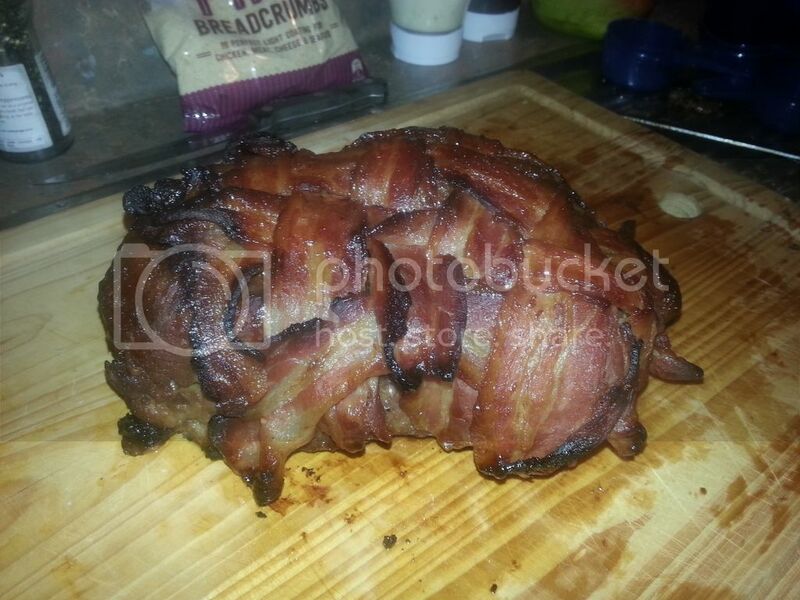 But here is : Bacon Wrapped, Whiskey Glazed Meatloaf. jeez, this is making me hungry lmao..
Pretzels, the small store bought stuff is crap. Paul Hollywood's recipe is pretty good, although I haven't tried the orange and poppy seed yet. Gordon Ramsay's baked beans and potato cakes with a little basil garnish, only had cannellini beans but was still good. They went soft and lost the crunch the next day, also tasted a lot more malty. I'd say it's best fresh. Last edited by Viilai; 10th May 2016 at 4:12 pm. Naan bread, I think I've got it dialed in for next time. Toffee attempt round 2. Much better! I don´t usually take photos of food I make but I made gingerbread cookies. Look like black magic cookies. Haha I was only having fun at home. I don´t associate myself with any cults. Made these things called Kåldolmar last night. Minced meat and spices wrapped in wilted cabbage leaves. They get pan-friend and finished in the oven. Served with gravy and mash. Not bad. All times are GMT +13. The time now is 9:47 pm.